As expected Grand Theft Auto V will be getting the Special and Collectors Edition treatments that so many games get these days. For those interested in Rockstar’s latest entry in the series these two options offer up some additional perks while perhaps being priced just a little too high. 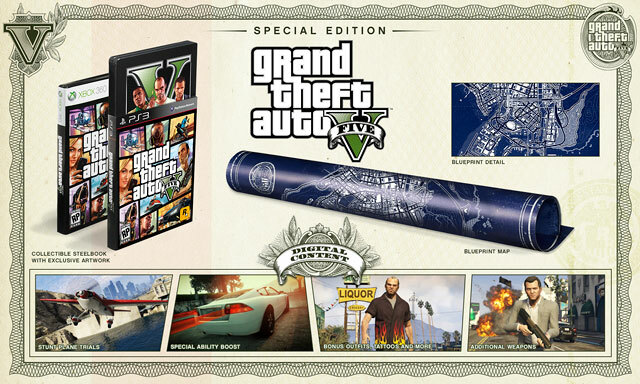 If you want to delve a little deeper into the world of GTA V a “Special Edition” will be available for the price of $79.99 and will feature Steelbook packaging, a blueprint map of Los Santos as well as in game goodies such as bonus stunt plane missions, in game customization options such as clothes and tattoos, boosts to character abilities, as well as exclusive weapons for use within the city. 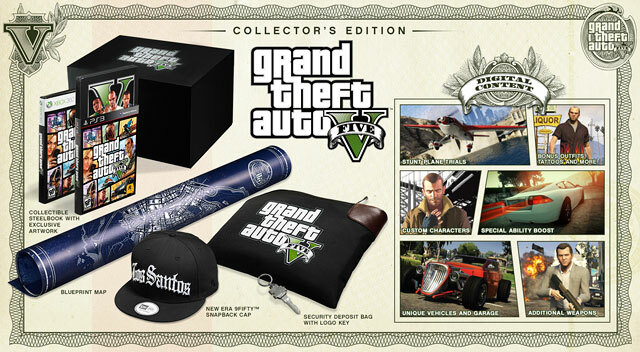 If that isn’t enough GTA perks for you then there is also going to be a “Collectors Edition” of GTAV that will retail for $149.99 that comes with the content found within the “Special Edition” as well as additional in game goods as well as that of the physical variety. The “Collectors Edition” content adds a garage at the start complete with a Hotknife Hotrod and a Carbon RS bike as well as a Khamelion for multiplayer. Additionally Collectors owners will be able to use classic GTA characters in the games online offerings. As for real items this package will also come with a GTA security deposit bag and keychain and a 9FIFTY hat with Los Santos logo. Overall the “Special Edition” may be worth picking up for the additional perks within the game but the additional $20 may be asking too much. The same can be said for the “Collectors” package, it seems rather slim for the asking price. 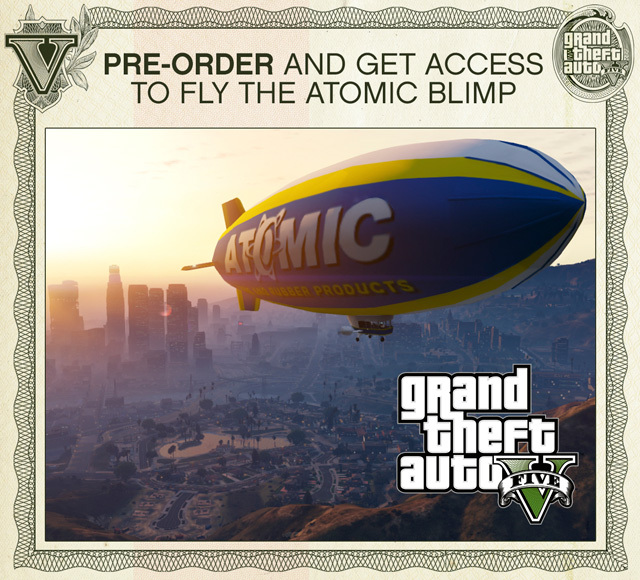 Either way a simple pre order of this sure to be awesome title allows you to fly about the world very slowly in a totally inconspicuous blimp. I fall into this weird middle space with special editions where I think all of the stuff would be cool if I got it for free, but I would never feel compelled to buy it. Having said that, I do that with most things in my life (“x would be nice but I’m too cheap so I’ll settle for y”) so . . . what do I know, haha. Thank you! We appreciate your kind words and nomination.